Every time I don Encre Noire, I initially experience a moment of surprise at the niceness of its simple yet satisfying presentation of inkiness, dark smoky woods and green cypress. The opening is a real winner, but there's no possible way that this fragrance could ever make it into a regular rotation for me, much less become a signature scent. Why? Two words: Darth Vader. 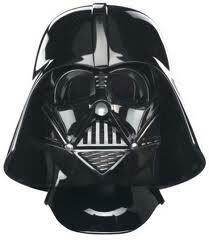 The Darth Vader effect is the name which I now associate with the complete and utter fuminess of this fragrance. Big, expansive, bloblike sillage, which continues to swell and envelop the wearer as a suit of dark armor until it is finally shed by immersing the body in a hot bubbly bath. The name came from a reviewer at Fragrantica, who correctly, I believe, identified Encre Noire as the scent of Darth Vader. My own take on this phenomenon is that donning Encre Noire actually transforms the wearer into a type of Darth Vader metaphysical doppelgänger, making it possible to cross from reality into fictionality—if only in his (or her!) mind—to become an invincible warrior. This, I gather, is the true secret to Encre Noire's success. Six years since its launch, this fragrance for men continues to command a following, as evidenced by the fact that it remains a top seller at Aedes (#14 as of today). This is significant because Aedes sells its perfumes at full MSRP, so consumers are definitely thinking of this fragrance as niche. 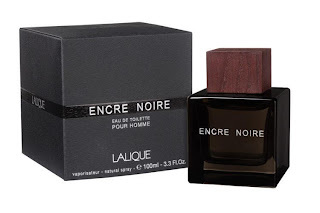 As most readers of this blog are no doubt aware, all of the Lalique perfumes can be had for a small fraction of MSRP from a variety of discounters, and you may rest assured that no one is in a lab cranking out knock-offs of Encre Noire, given its near ubiquity. Realistically, people looking to acquire a bottle of this mythic juice have a range of choices from roughly $30 to $150. The choice, therefore, is yours. I myself picked up a bottle scent unsniffed out of curiosity from a discounter, of course. Low stakes gambling is quite all right with me. In fact, I rather liked what I found inside the sleek black cube which arrived at my humble abode about two years ago now. I have to admit that after wearing this unique sci-fi creation a few times, I chuckled out loud upon reading Tania Sanchez's characterization in The Holey [sic] Book of this perfume as “clean vetiver”. Um.... would that be drycleaning perhaps? What a fume factory this substance is! But it's not a neat solution of iso-E-super, a solvent of which I seem to have been suffering fatigue of late. No, Encre Noire manages to scent its weirdly synthetic fumes with an enticing mingling of smoky vetiver and cypress, making it seem initially really quite appealing—a sure hit at the counter, no doubt, where sales are made pre-drydown. I am convinced, nonetheless, that Encre Noire managed to stake out a piece of previously uncharted territory on the grand olfactory map, carving out a brand new genre: the Darth Vader frag. After a few hours of wearing Encre Noire, I always come to the same realization: that my cells have reached saturation, and I will not be able to wear this fragrance again anytime soon. It usually takes me a few months before I forget, not the name of the Darth Vader, but the subjective effects of this fume on my body and mind. I hate to say this, but it reminds me of inhaling nitrous oxide or sniffing glue or the fumes off the nozzle at a gas station or the sulfurous scent of freshly lit matches. Or, yes, to be honest, drycleaning fluid. Perhaps even the substance used in air conditioners. Okay, I've never sniffed any glue (although I have of course caught wafts of the stuff! ), but under a dentist's supervision I have inhaled nitrous oxide and on another occasion as well with some friends at a party. Another time for some reason—don't recall the details—I was inhaling helium from balloons, which made my voice sound like that of a munchkin. So, yes, it's fun, in a strange, probably poisonous way, but the multi-hour effect on my mind of Encre Noire, an utterly otherworldly composition, more than anything else, is to make me realize again and again how completely fortuitous it was that I never fell in with the toxic substance abuse crowd. Do I like it? Yes, I'm afraid that I do. Will my 100ml bottle last a lifetime? Yes, it will. I find that buying Lalique perfumes blind online is pretty much irresistible—there's so little to lose, and most of them are pretty good, albeit quirky and eccentric. Indeed, their manifest quirkiness is a big part of their appeal for me. Lalique perfumes tend not to smell like anyone else's—whether designer or niche. So, yes, I naturally acquired a bottle of Encre Noire pour elle, the made-for-women follow-up to the successful Encre Noire for men. My initial reaction upon receiving the bottle was that it was ugly. It had been marred by the addition of a white wedding script completely at odds with the sleek and modern aesthetic of the black cube. It just did not make sense to me at all. Until, that is, I tried the perfume. It seemed to me that Encre Noire pour elle was compositionally a flanker. It just struck me as a boring, thin oriental. I do not like this development in perfumery of a weaker, diluter oriental perfume. My view is that if you're going to do an oriental, then do an oriental! Don't hold back. Who wants oriental lite? Well, apparently someone out there does, as the number of such perfumes continues to augment. Like its namesake, Encre Noire pour elle seems very low on, if not totally devoid of, flowers. But it also seems pretty low on all of the other notes—with the exception of one: kephalis. When I first experienced Encre Noire pour elle, I was unable to detect any isolable notes whatsoever. It just seemed like a meh festival, a mingling of watered down orientalia. I love ambrette, and it's simply not detectable by my nose in this mix. So my initial take on Encre Noire pour elle was that it was a sort of after thought, something thrown together in a hurry to pour into the same beautiful black cube and ride on the wave of its namesake's success. The flowers seemingly intimated by the wedding script were not delivered. All in all, this flanker really seemed to me like a flanker. I have moderated my opinion of Encre Noire pour elle since that initial, negative evaluation, as I have come to see that it is more complex than your average thin oriental, and the synthetic quality imparted by the kephalis makes this composition, too, seem rather modern. 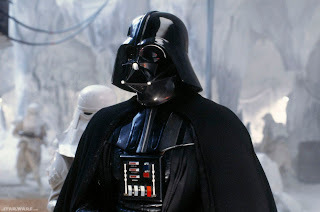 I also have found that if I allow myself to wear this perfume for more than a couple of hours then it, too, begins to manifest a bit of the old Darth Vader effect. It's lighter, but it is still there: a fumey, solventy scent which grows stronger over time. And, yes, there is something peculiarly appealing—perhaps even addictive—about it as well. So with the benefit of multiple wearings I have decided that Encre Noire pour elle is not a bad fragrance, but it is what it is, and it's not what it's not. I would describe it as a hybrid between a modern, abstract synthetic composition and a light oriental. I do not dislike Encre Noire pour elle. I'll retain my black cube, the female sidekick to Encre Noire. But it, too, will never need to be replaced. I had already reviewed both of these fragrances before, but for the purpose of this His or Hers? series, I decided to compare them directly side-by-side, knowing that I had a bath on the horizon. Yes, truth be told, I could never wear either of these creations to bed. It's not that they degrade. No, it's rather that they never, ever fade away without some sort of aggressive bathing intervention. With Encre Noire on the left and Encre Noire pour elle on the right, my choice after an hour or so became a simple one: Darth Vader or Darth Vader's rib? I own both Encre Noire and Encre Noire pour elle, so it might seem as though I like both of these perfumes quite a lot. And I do, in theory. In reality, I rarely wear either one of them. I have a sneaking suspicion that the synthetics in these perfumes may be fat soluble, and my cells will only accept so much before they must be flushed with fresh air or natural perfumes. As far as the bottles are concerned, the original, without the wedding invitation script, definitely gets my vote. The body of the two bottles is the same geometrically: sleek and attractive. The cap on the original is made of wood, while the pour elle is smaller (men have bigger heads than women?) and made of hard plastic, but they both look pretty nice in their own right. The women's cap is separated from the bottle by an elongated gold neck vaguely reminiscent of the Dior J'adore ads. (Okay, very vaguely...) All of this leads me to believe that the somehow completely unfitting script on Encre Noire pour elle may have been a last-ditch effort to inject a bit of femininity into the launch, but the truth is that the composition is not feminine at all, so ironically the only purpose it serves is to deter gents from buying a bottle! Encre Noire pour elle really is unisex, and the kephalis is strong, but nothing like the fume generator that is the original Encre Noire. Because both fragrances have a similar effect by the drydown, but the made-for-men is much stronger than the made-for-women version (somewhat ironically, since the former is an eau de toilette while the latter is an eau de parfum), it is not at all inappropriate to say that the flanker is tantamount to Encre Noire Lite. Yes, the spelling is intentionally artificial. 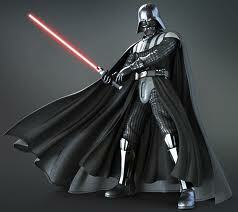 If you're going to do the Darth Vader dance, why not go all out? His gets my vote today.